September 17th, 2013. Today, Canonical, in cooperation with Microsoft, is announcing that Juju fully supports deploying services on Ubuntu into Windows Azure. This means that from tomorrow, September 18th, Ubuntu users can use Juju with its intuitive GUI to design and deploy sophisticated application infrastructure instantly into Windows Azure. Fresh Ubuntu Certified images for all supported Ubuntu releases are currently available on Windows Azure delivered with fast, highly available local archives to keep you up to date. With Juju support on Windows Azure you can now deploy over 100 services (Juju Charms) onto your Windows Azure Ubuntu instances. 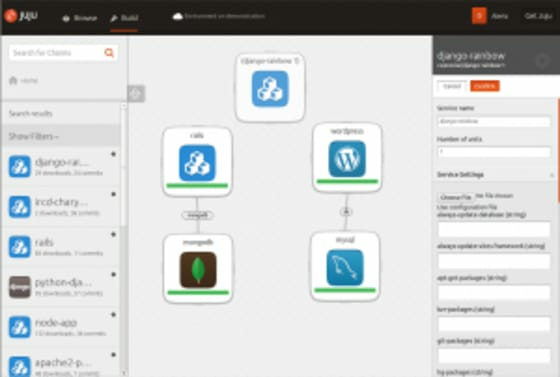 With service relations and scaling built into Juju, automating your cloud infrastructure has never been easier. To keep the user experience optimal Juju leverages Simple Stream cloud data to automatically know which Windows Azure cloud image is the freshest for a given release and region so you don’t have to worry about image IDs and keeping up with the latest published images. With $60k in prize money for the Charm Championship the timing has never been better to deploy your infrastructure with Juju. Deploy your infrastructure in Windows Azure, share your solution with Juju export and you could take home one of the prizes. More details are on the Charm Championship homepage.